I photographed this skull with a gold wreath while in Crete. It was discovered while excavations were taking place and is believed to have been that of an athlete. In the second large photo below a coin is also shown which was found inside the skull's mouth. This is a silver tetradrachm from the Cretan city of Polyrrhenia from the period of the Roman Emperor Tiberius (14-37AD). The coin was placed in the mouth of the deceased as Charon's fare for passage to the underworld. 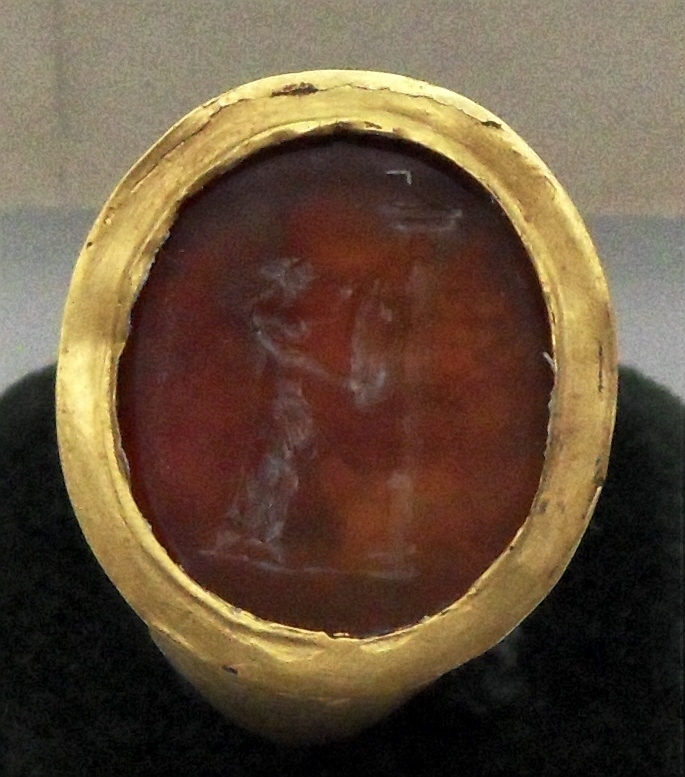 The ring was found in the left hand of what is believed to have been an athlete. 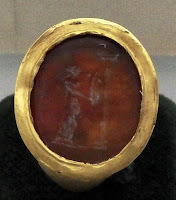 Though not very clear the stone has a picture of a female hanging a shield, or trophy on a column - indicating his prowess in his field. The gold wreath indicates the deceased's success in athletic contests and also alludes to posthumous deification. The wreath has also a supernatural side in that it offers protection from demons. For some reason I feel that the athlete would be proud that his skull, wreath and ring are on display some 2000 years following his death - a form of immortality. However some bones and skeletons I think should be left in peace - see photo below. To me these bones have an element of sadness about them. They are very ancient, from the Crete Minoan period, and could well be several thousand years old. Some things though should perhaps be allowed simply to rest. See also: The Crete Coincidences And What Is Really Important. I must admit I'm torn between fascination about the like of an athelite who lived o long ago and the idea of respecting the dead. Wow, how did I miss THIS post? Wonderful post, Mike. I agree, there is an element of sadness about these bones. Who were these people? What were their lives like? I think the dead need respect. If it were up to me, we would leave them in the ground where their lives once were (just personal thoughts). Thanks Lisa. Good luck with your continued search.